Why should we watch Gunpowder? The story follows such a fascinating, dark and twisted piece of British history which is very close to being forgotten in the fog of time. You may know the name Guy Fawkes - as it has been attached to all sorts of things, from Occupying Wall Street to V For Vendetta - but many won’t know the whole story. It goes far beyond the name Fawkes and examines many fascinating characters and their desperate, tragedy-strewn lives. 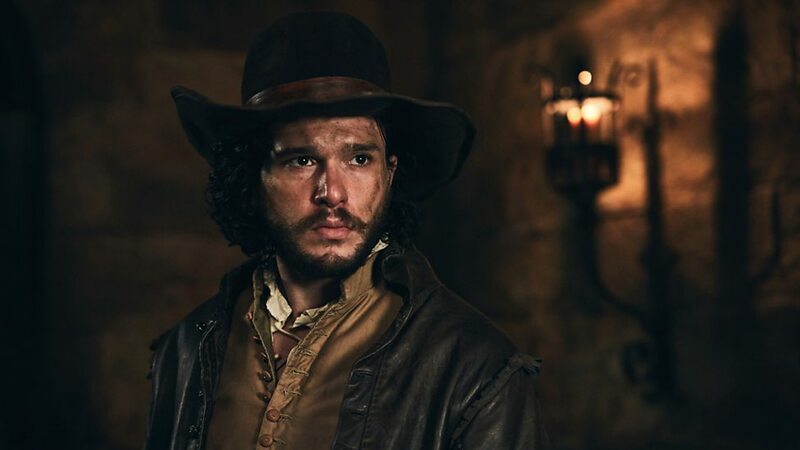 Gunpowder is all about choices, and the reasons desperate men make such choices, and it makes for really great drama. We think we know everything about the Gunpowder Plot… Guy Fawkes trying to blow up Parliament, right? Or is there more to it than that? There really is - Guy Fawkes was the tip of the iceberg. Many people know he was working with plotters, but don’t know much more about who they were or what their motives were. And so little is known about the lead up to the night of November 5, or what happened after it. In Gunpowder, we show the whole story. In so many dramas on TV today you see anonymous bad guys without a narrative, but what we’re trying to do is to tell the story from the plotters’ perspective as well, to try to understand what pushes people to do horribly violent things. We wanted to tell a story from both sides. How important was Ronan Bennett (writer) to creating the series? Ronan was the perfect person to write this. Daniel West - who I developed the series with - and I knew that we wanted to do something about the Gunpowder Plot, but we didn’t know where to begin. Ollie Madden at Kudos and then Ronan, the master creator and writer that he is, came in and crafted the whole narrative so beautifully and with such delicacy. I think what is particularly exciting is that Ronan decided to use the vernacular of the time and he did it with accuracy. He has a PhD in English 17th Century history so he has a very deep knowledge and sense of what this piece is about. He couldn’t have been more excited about it. I’m in such admiration of the man - he has penned an amazing story. What has it been like working with your fellow cast members? I am thrilled with the cast and the fact that they wanted to join this project with me. I’m working with actors across the board who I have admired for a long time. Peter Mullan is someone I have grown up watching and the sheer presence of what he brings on screen is brilliant. Liv Tyler is another actor whose work I know well. Mark Gatiss is known for bringing incredible characters to life. When I saw his audition tape I fully realised the artistry of the man - he created the character of Robert Cecil beautifully and with pin-point accuracy. We also have some actors of my own generation who are really interesting young men. Tom Cullen, for example, was in my year at drama school and is a brilliant actor. We also have Edward Holcroft, who I loved the work of in London Spy and other things, and Robert Emms, who I did my first job, War Horse, with. Were there any production challenges in creating this 17th Century world in 21st Century Yorkshire? Was everything as you expected? I have really enjoyed creating this world. I think our production designer, Grant Montgomery, is a really talented man. He built all the sets, including the streets of 17th Century London. It’s not easy to build a period piece and he did it incredibly. I’ve really enjoyed watching the set grow. I always said the day I walked onto the set would be a magical moment, and it really was. Whenever I’m on another TV or film set I have to remind myself that what I’m seeing all came out of an idea and so many contributions in order to create the final product. It has been an eye opening experience working as an executive producer, as I have been across that different side of things. As an actor you don’t usually get to meet the set designer or see the planning behind it, but I saw it all happen and that was kind of special. I have really loved watching Derek Riddell play King James. I knew he was a brilliant actor beforehand but I found it fascinating to be around the camera while he worked on this piece, watching him bring King James I to life in such a nuanced way. I also found the opening with Shaun Dooley (Sir William Wade) on the Baddesley Clinton set very exciting. It’s a crash, bang, wallop of an opening and it sets the scene for a programme that will not just be a slow burn of a typical period or costume drama. We wanted the strange, old-fashioned vernacular to clash against viewers’ usual expectations of a slow, boring period piece, as they quickly find themselves in a very real, visceral, and violent world.